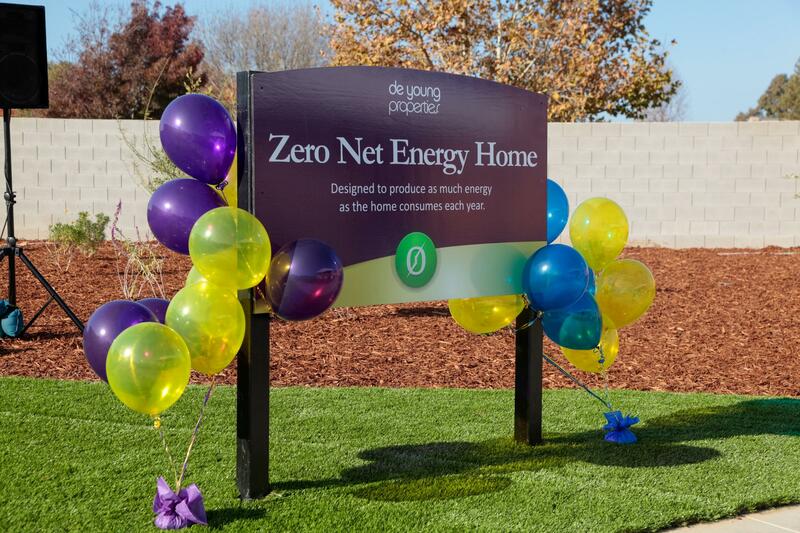 De Young Properties designed and built a Zero Net Energy (ZNE) home in Clovis, CA. The ZNE-design goal was set at source-energy ZNE  during the design stage. The source-energy ZNE criterion requires the home to produce as much energy as it consumes on a net, annual basis, with all energy, both consumed and generated, determined at the source (power-plant). Considering costs, market, and sales, De Young used a standard plan for the ZNE, with increased energy-efficiency features. Iterative analyses of potential efficiency designs were provided by BIRAenergy  from which the team settled on the ZNE efficiency-features. Those energy-efficiency features alone, exclusive of the 6kW PV system on the roof, the home will use 64% less energy than if built to Title 24 requirements. Air-sealing the envelope and moving ducts into conditioned space were among the most challenging elements of the ZNE design. To move ducts out of unconditioned space, De Young decided to drop the hallway ceilings to make duct-chases in the conditioned space. 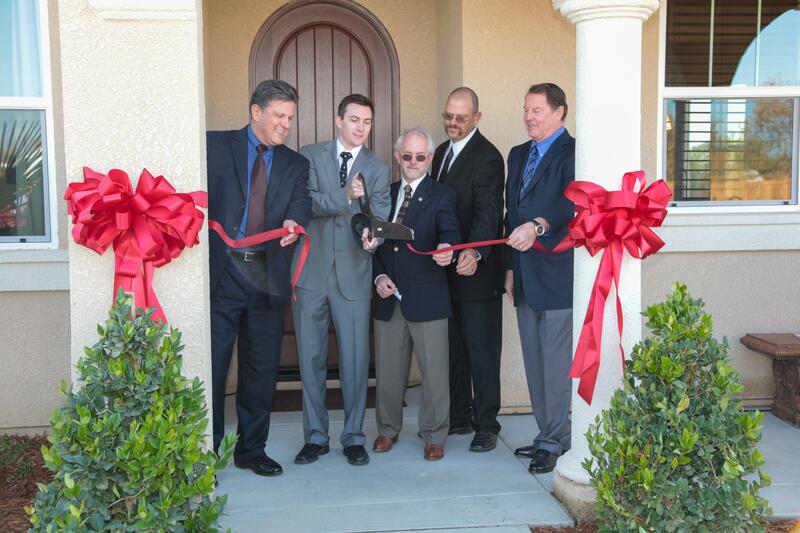 The final efficiency package was evaluated with the house as an entire system, and ensuring that the house-as-a-system met the source-energy ZNE goals set for this project at its inception. This systems analysis also led to requirements for inspections and tests of components and systems as the house was built. Thus, during the course of construction, BIRAenergy staff, De Young VP Operations, the site superintendent, and the third-party testing company made multiple visits to the De Young site to inspect the construction to verify the efficiency measures, and to test installations to ensure quality installation practices were employed. 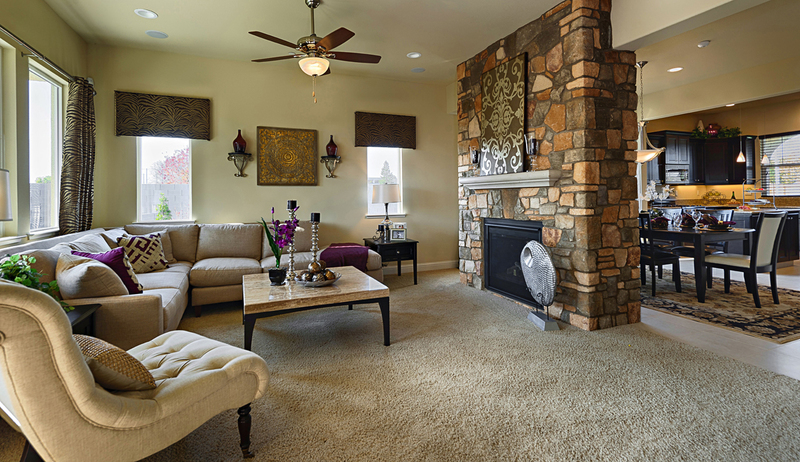 The home passed all of the many tests and inspections required by the design. In addition systems, such as the HVAC system were commissioned prior to completion of the home to ensure proper settings and function. Energy analyses were performed using BEoptE+ v1.3 in Climate Zone 13, which includes Fresno and surrounds. The 6kW PV system on the rear and side roof-planes, in combination with the efficiency package, produce Source-Energy ZNE, and with the CEC-CPUC decision to define ZNE based on TDV, the home is a net producer of energy. The Energy Performance Modeling process involved many parametric simulations of individual energy efficiency features to rank them by cost and impact, accompanied by selection and rejection of measures based on other builder concerns including availability, subcontractor knowledge or training needed for different features, and overall marketability. The selection of eligible features was followed by iterations of whole-house energy simulations that captured the interactions of the chosen features and provided measurement of progress toward the ZNE goal. This process again highly considered costs and practicality trade-offs, and required detailed discussions with the builder as well as contractors, vendors and other project stakeholders. Moving ducts into conditioned space, and making the envelope tight produced the largest impacts, and were very cost-effective. While there are many permutations of efficiency features that can result in a ZNE design, the set developed with De Young is the result of an iterative design-development process that involved closely working with the builder to use features that they chose as the most cost-effective and marketable. The “final” design package included solar water heating, which was desired by the team, but modeling showed that equal energy-efficiency could be gained by replacing the solar water heating with a heat-pump water heater and one 250 W PV panel, at a cost savings of several thousand dollars. This was the last design decision made following many other iterations of: design, simulate, estimate costs, and evaluate, resulting in the final ZNE Package. Following this ZNE design process, De Young completed construction of the ZNE home in late 2013. The embodied energy in a building can be calculated by summing estimates of embodied energy in the construction materials plus that due to the actual construction of the building . The nine construction materials with the highest levels of embodied energy together account for 50% - 70% of the total embodied energy in the construction materials in the building. This partial estimate can then be factored up to estimate the energy embodied in 100% of the construction materials. The energy used in construction of the building is calculated using factors established for the type of building, and this energy is added to that of all the construction materials, producing an estimate of the total embodied energy of the home (see Table 2). For the De Young ZNE Home this embodied energy is 508,148 kBtu. BEoptE+ simulations of the De Young ZNE Home and the same plan built to meet Title 24 predict annual source energy savings of 147,180 kBtu/yr from the ZNE home, compared to that for the same building but with code-minimum efficiency features. This annual energy savings will recover the embodied energy in the ZNE home within 3.5 years. The resulting ZNE concept home is available for viewing in Clovis and is being monitored and evaluated by PG&E and De Young Properties to study its performance compared to simulations. After its first year, the home has successfully met our goal of offsetting all source energy consumed by the home. At the start of this project, the units for determining ZNE (site, source or TDV) had not been standardized by the CEC and/or CPUC. BIRAenergy used the NREL BEoptE+ energy-modeling software to develop the ZNE design. Our ZNE Home was designed with a -29 HERS score, assuming Source ZNE. It is also GreenPoint Rated, for assurance of sustainable development and construction practices. Our company has received the prestigious Gold Nugget Award for Best NetZero Energy Home Design from the Pacific Coast Builders Conference (PCBC) in 2012 and an Award of Merit for Zero Net Energy Home Design from PCBC in 2013. Renewable Energy System Description & Details: SolarCity 20-Year Pre-Paid Solar Lease. 6.125 kW facing south and west. Typical single-family residential construction, with 2x4 16oc framing, slab-on-grade foundation, and concrete roof tile. We used high-density R-15 batt insulation in the walls along with a continuous layer of R-4 rigid insulation board on the exterior. Used no slab insulation as we are in a hot climate. 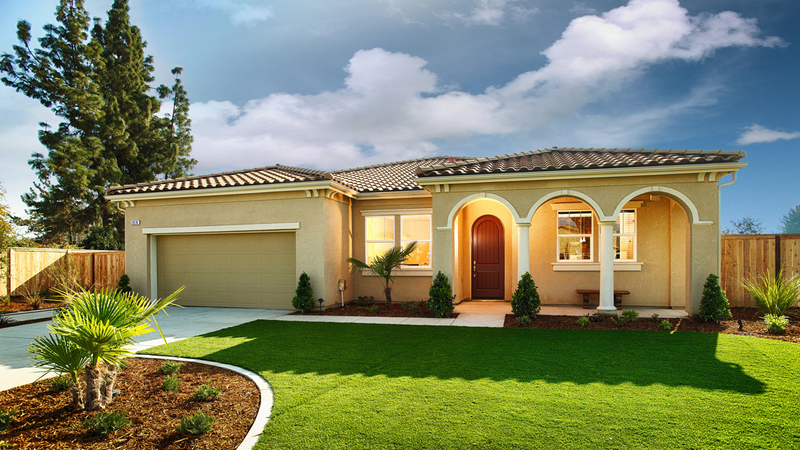 Monte Verde Windows: Vinyl, dual-pane, triple-layer low-E, argon gas-filled windows made by Anlin in Clovis, CA.